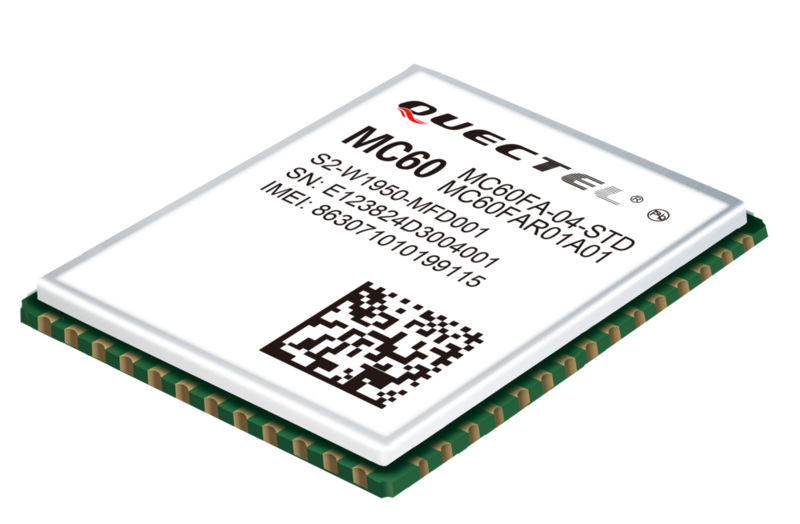 MSC Technologies, a company of Avnet, Inc. (NYSE: AVT), now offers Quectel’s new MC60 GSM/GNSS combo module. The MC60 is the worldwide smallest module when it comes to offering GSM, GNSS and also Bluetooth classic integrated in a single module. The MC60 is supplied in a 68-pin LCC package measuring 18.7 mm × 15.8 mm × 2.1 mm and weighting approximately 1.8g. Based on a combination of the MTK chipsets MT6261 and MT3333, the MC60 supports GSM and GPRS in the 850/900/1800/1900MHz frequency bands and GNSS in the L1 1575.42 MHz and 1601.71 MHz frequency bands. As the MT6261 features GPRS multi-slot class 12 with GPRS coding schemes CS-1, CS-2, CS-3 and CS-4, a downlink and uplink data rate of 85.6 kbps is achievable while maintaining the low power consumption of 2G networks. Additionally, the MT6261 supports Bluetooth classic up to Version 3.0. As of now, the available profile here is the widely applicable Serial Port Profile (SPP). For applications like vehicle/person/pet tracking systems, safety systems, wireless POS, industrial PDA and remote maintenance or control systems, the implementation of GNSS based localization functions is a great value add. Thanks to the integrated MT3333 chipset, the MC60 is capable of using GPS and GLONASS satellites utilizing up to 33 tracking, 99 acquisition and 210 PRN channels. Boasting an acquisition sensitivity of -148 dBm and a tracking sensitivity of -165 dBm as well as a time to first fix (TTFF) of <15 s from a cold start with EASY™ and of <1 s from a hot start, the MC60 is up to the task for most positioning applications. Speaking of applications, the MC60 module is specified for the extended operating temperature range from -40°C to +85°C to fulfill typical industrial requirements. Looking at the interfaces, the device features 3 UART interfaces for GSM functions as well as 1 UART interface for GNSS, 2 output channels and 1 input analog audio channels, 1 SD, 1 GPIO, 1 PCM and 1 RTC interface. On the protocol side, the device integrates internet service protocols such as TCP/UDP, FTP and HTTP. Also, features like eCall, DTMF, QuecLocator, QuecFOTA and Dual-SIM are implemented, to list some among others. First samples of the MC60 GSM/GNSS combo module are available today.